Media Brief: Civil Society Strengthens Public Procurement at the sub-national level to local authorities and citizens. Kompong Thom province – To reduce corruption at sub-national level, SILAKA conduced the campaign of strengthening procurement system at the sub-national level to local authorities and citizens in 5 districs/cities at Kompong Thom province. 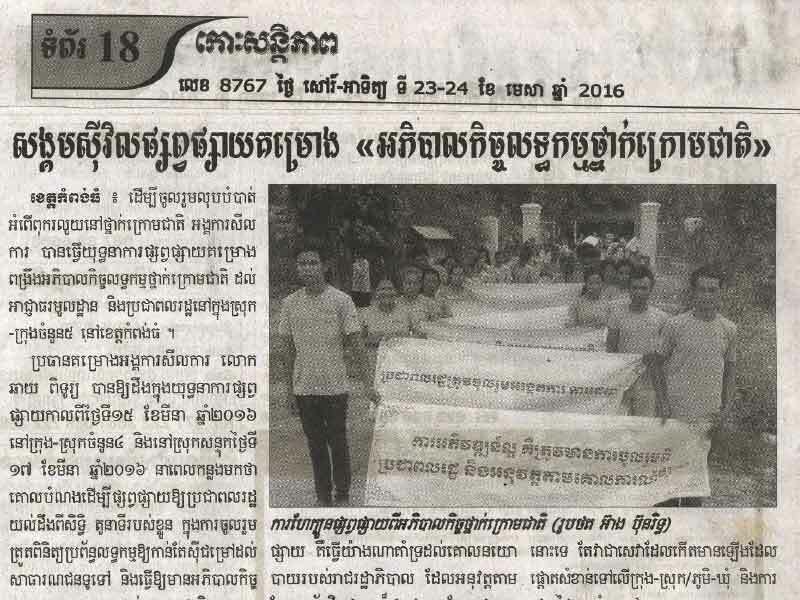 Mr. Chay Pitou, Project Manager of SILAKA, said at the campaign on 15 March, 2016 in 4 districts/cities and in Son Tuk district on 17 March, 2016, “the purposes of campaign are to raise awareness of citizen’s roles in observing and monitoring public procurement process, and to educate and increase attentions from people in order to engage the participatory monitoring in public procurement and improving leadership skill among local authorities”. Ms. Thida Khus, Director of SILAKA, said “through the campaign in Kean Svay district and Takmao town showed that project implementation in Kompong thom province gets good outcomes”. The main purposes are to promote governmental policies that is implementing decentralized system to reform public administration through government’s Rectangular Strategy First, Second and Third and Good Governance is the core element of strategy. Added that the implementation of this project are to engage people in public procurement, in order to reduce corruption at sub national, and have ownership in development and have transparency before deciding on their works. Meanwhile, Thida also raised that the public procurement is not only focused on building roads or other infrastructures but it is also the service that focusing on Cities, village /Commune and other biding. She claimed that the project that has been implementing is engaged from citizens in monitoring all investments and bidding and also reduced inactivity. Notice that this project is also implementing in Kompong Thom province including Stung Sen city, Kompong Svay district, Son Tuk district, Brasat Balang district and Steung district, which cooperated with provincial governor, district governors and citizens. Translating from Koh Santepheap Daily (Local News) published on 23-24 April, 2016.